ComMetrics – Bloggers: Can I trust you? In this post we discuss four points to keep in mind when trying to develop or improve your social media strategy. The points below should be considered from the beginning and get revisited six months later. 1. What types of social networks do we belong to? a) Virtual network: These are the people who are your Facebook friends, Twitter followers and so forth. They might follow your updates to gain information or just want you to follow back. b) Knowledgeable ideas crowd: These are the people who live and work in different worlds. We respect them for their knowledge, as well as feedback and comments left in forums like this one. c) Support and coaching team: These are the people you work with, trust… and ask for advice. You respect them, and email or speak with them from time to time. Most importantly, your relationship is close enough that you take their feedback and criticism seriously – i.e. taking action to remedy a problem someone points out to me here. d) Rescue team: These are the people prepared to ride out with us, so when things get really tough you can expect a quick response to your email and understanding for your problem… They provide support and help – I might have about five people in this group. I try to talk to members of this group via phone or meet face to face if geographically feasible. e) RECHARGING BATTERIES team: This is a real physical place with real people who know and love you. Getting together, sharing dinner or going for a sleigh ride makes all the difference in feeling connected… This one is important to each of us and an ever greater challenge for people in cities who might feel a bit lonely. Quite likely your Xing or LinkedIn connections belong to group A. You might be able to move some people from your LinkedIn network of connections into group B or C, but you will never really know some of your Twitter followers or follow back their tweets. They remain part of your virtual network without really being connected to you. In fact, they might not even read your tweets. 2. What difference do weaker and stronger ties make? Having close or strong social ties with more than 150 people, including family, is difficult. Hence, some of us use asymmetric follow (see 4 ways to Twitter success) to keep the number of status updates to scan at a manageable level on Twitter, Facebook and other networks. The challenge is knowing whether your 100,000 Facebook fans, Twitter followers or LinkedIn group members can become closer connections by moving from your virtual network of a relatively anonymous mass of people to the more personal support and coaching team. It is certainly possible, and it is key to getting the necessary volunteers for future fundraising. However, few will take a risk and stick their neck out to come to your rescue in a forum if you or your brand are getting attacked by some nasty follower on Twitter or friend or fan on Facebook. 3. Is our strategy working? It is obvious that some people need to be identified and moved along the continuum to strengthen ties. In turn, these individuals may write a helpful review about your product, an insightful comment on one of the corporate blog posts or participating in discussions with the company’s group on Xing. our group on Xing now has 2113 members. – What do you do if your boss wants to know what these numbers mean? – Did the new members purchase something? 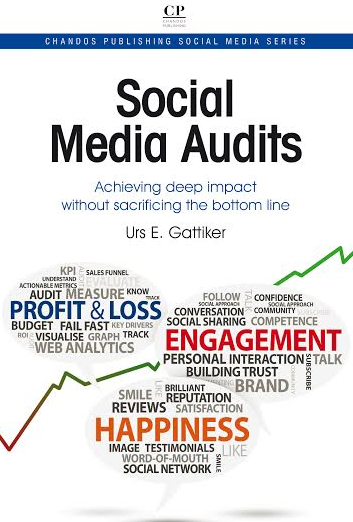 – Did engagement efforts on your social networks do your brand any good? Needless to say, unless we started with a precise strategy and objectives before launching on any social media channel, it is difficult to show how our efforts supported the company’s activities. While having weak ties with millions of people is great for a consumer brand, we know that this might not make a difference in the capital goods business, such as manufacturing container ships or managing harbors. In these cases, stronger ties with fewer people who are or could become your clients (e.g., engineers, regulators, and energy suppliers) could be more beneficial. Hence, the challenge to manage is how close your relationship with Xing group members or Facebook fans is. 4. How do we know we are succeeding? A safe way to find out whether things are working is measure them. Here it is helpful to outline your success criteria, including metrics, before embarking on your strategy. Moreover, these criteria and metrics must be understood and agreed upon by you, your co-workers and stakeholders. And unless we try things out we are unlikely to discover if things worked out or not. As a luxury brand, selling more watches, bags or sweaters thanks to your Xing or Facebook group is highly unlikely. But a small group discussing issues, providing advice or inspiration to people in your target group can help foster greater engagement and customer satisfaction. Having a presence on the networks that your clients hang use is a start. However, some may not want to engage with your brand on certain platforms, such as Facebook, but the client may be happy to do so by joining a LinkedIn group. To illustrate this further, our owners are happy if we can report back that some of our clients got to know us first through social media channels like our corporate weblog or Xing group on SM monitoring. This may have happened months before they signed on the dotted line. 1. Setting a strategy with goals to be measured through actionable metrics is a good start, but unless you take many small, frequent steps while measuring to see if they have an impact, it will be hard to show progress. 2. THE best strategy for small companies is word of mouth: focus on getting 100 people tweeting praises about your organization, because that is far more beneficial to your bottom line than having 100,000 passive followers. The latter likely will not catch and read your tweets or ever write a comment on your Facebook wall. Nor will they tell others good things about your customer service over coffee. 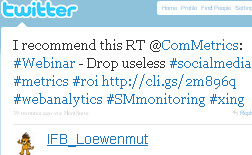 ComMetrics – Social Media Monitoring group on Xing – 2010-04-28 webinar – what do you do when your SM strategy fails? ClickZ – After a sour start in social media, skittles gets sweet results => Giving away discount vouchers and free product helps now, but does it help in the long term as well? What is your take? How did your team develop your company’s social media strategy? How was progress or failure in realizing the strategy on time measured? Did it work? What needed changing? Share, please! Please let us know in the comments! Webinars are held every Wednesday at 8:45 AM CET AND now also at 4:00 PM CET for no more than 20 minutes – the time you spend on a coffee break. I particularly like the social networks typology you provide at the beginning of this blogpost. I like it because it provides us with a real life continuum of social networks we belong to, beginning (or ending) in the internet and ending (or beginning) at home. I think this continuous view is exactly what we need if we want to get out of the prolongued social media pioneer phase. I personally think we should get out of that phase as it tends to favor a fetishist view on social media as a separate reality all on its own, to be celebrated by special rites. Social media in my view are neither to be celebrated, nor do they provide us necessarily with a reality totally different from other realities. Your typology can help us to normalize social media by connecting them with other types of social interacting. Thanks for your comment above. For me it is important to point out that these categories are fluid. Hence, the degree of weak ties vs. strong ties depends on many factors. To illustrate, those people that might belong to our coaching team might also be part of our rescue squad. In fact I have two people that belongs to my coaching team as well as being member of my rescue squad. If we would live close enough, they would both be a member of my recharging batteries team. In turn, our families would do some joined activities during some weekends, such as hiking or going to the movies. Social media has changed a few things for me. I now have close ties to people I have yet to meet face-to-face. I am sure that just about 10 years ago that would have been harder to accomplish. Thanks for sharing and I look forward to your next comment. Urs, concerning your classification system, i'm not so sure if you can discriminate them properly. How do you classify them? Can you apply some meaningful metrics? How do you classify me? I find myself in almost all categories. It's a fluet continuum. Aldo nnthanks for posting this comment. Seems as if I did not explain some things carefully enough. Let me try to respond to your concerns.nn”How do you classify me?”nnIf you ask me how I would assign you to one of these types of networks in my network of nodes (remember, looking from my end or side), I would respond as follows:nna – you started out being part of MY social network a – no clue who you were just one of my Twitter followers and Facebook connections. nb – We then connected (commenting on each other’s contributions in different forums) and you slowly but surely became part of my knowledgeable ideas crowd;nc – With this comment you have gone so far as beginning to coach or teach me a few things in the process about issues regarding metrics and social media.nnGreat, I can hear you respond but now what? Well we could agree that this factors or markers indicate a few things, such as:nna people can move up in these networks and down again (e.g., if we loose touch);nb as I pointed out in my response to Stan, people can be a member of more than one of these networks at the same timennI find your question about how we could apply some meaningful metrics in order to classify social nodes in our network of connections very intriguing. I have been thinking about this a lot. nnBy now I have come to the conclusion that whilst I love measuring things and charting the trends in order to improve, I wonder if this makes sense in this context of classifying your connections or nodes in these networks. nnWhat I proposed is not a complete framework that includes definitions, classifications as well as a belief system (Kuhn 1978) and so forth.nnPut differently, you know who your friends are but do you use some metrics to classify your friends according to points received? Probably not.nNevertheless, you have a very good idea who your friends are and whom you can count on for getting you home safe at night or whom you can call to baby sit your toddler if you need to go to a meeting right now.nnShould we have metrics to assign points to people who are part of our personal networks and then compare and classify them according to the score attained – some kind of benchmarking exercise? nI hope we can agree that this might be a bit over the top.nnHence, I would like to see my classification system for social networks just as an approximation tool that helps one to figure out how different people (or nodes) fit within ones connections.nnAldo, thanks for asking these questions. thanks for posting this comment. Seems as if I did not explain some things carefully enough. Let me try to respond to your concerns. a – you started out being part of MY social network a – no clue who you were just one of my Twitter followers and Facebook connections. c – With this comment you have gone so far as beginning to coach or teach me a few things in the process about issues regarding metrics and social media. I find your question about how we could apply some meaningful metrics in order to classify social nodes in our network of connections very intriguing. I have been thinking about this a lot. By now I have come to the conclusion that whilst I love measuring things and charting the trends in order to improve, I wonder if this makes sense in this context of classifying your connections or nodes in these networks. What I proposed is not a complete framework that includes definitions, classifications as well as a belief system (Kuhn 1978) and so forth. Put differently, you know who your friends are but do you use some metrics to classify your friends according to points received? Probably not. Nevertheless, you have a very good idea who your friends are and whom you can count on for getting you home safe at night or whom you can call to baby sit your toddler if you need to go to a meeting right now. 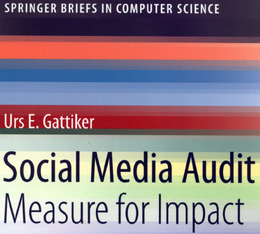 Should we have metrics to assign points to people who are part of our personal networks and then compare and classify them according to the score attained – some kind of benchmarking exercise? I hope we can agree that this might be a bit over the top. Hence, I would like to see my classification system for social networks just as an approximation tool that helps one to figure out how different people (or nodes) fit within ones connections. Aldo, thanks for asking these questions.